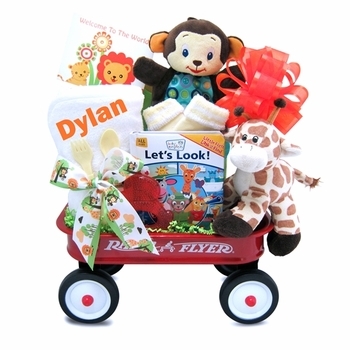 Featuring the popular jungle theme, this unique new baby gift set features great learning toys and activities plus a soft cotton hooded bath towel embroidered with baby’s name at the center of this collection! Terrific for baby girls and boys, this design Includes an innovative and educational book by Baby Einstein, interactive toys that crinkle and squeak plus teething toys to keep baby happy and entertained! This unique design is sure to delight all the animal lovers at the baby shower and makes a great choice for babies with a jungle themed nursery too! I don't live in the US and needed a baby gift for my sister. This looked lovely on your site and i am so pleased to say that it looked just as nice when she sent me a photo. She was very happy with all the adorable items in this wagon and I'm sure my nephew will agree soon! Thank you for all your help and I will use your site again in the future!